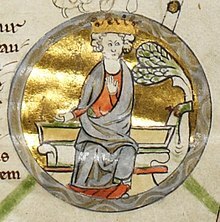 ↑ अ आ David Nash Ford, Edmund the Magnificent, King of the English (AD 921-946), Early British Kingdoms. ↑ "Here King Edmund died on St Augustine’s Day [26 May]. It was widely known how he ended his days, that Liofa stabbed him at पुकलचर्च. And Æthelflæd of Damerham, daughter of Ealdorman Ælfgar, was then his queen." Anglo-Saxon Chronicle, MS D, tr. Michael Swanton. फ़्लोडोअर्ड, एनेलेस, ed. फिलिपि लौएर, Les Annales de Flodoard. Collection des textes pour servir à l'étude et à l'enseignement de l'histoire 39. Paris: Picard, 1905.